US presidential rivals Republican John McCain and Democrat Barack Obama have attacked each other over foreign policy and the economy, in their first debate. Mr Obama said a $700bn (£380bn) plan to rescue the US economy was the “final verdict” on years of Republican rule. He said Mr McCain had been “wrong” on Iraq and tried to link him to President Bush. The Republican senator described his rival as too inexperienced to lead. Neither landed a knockout blow but polls suggested Mr Obama did better. 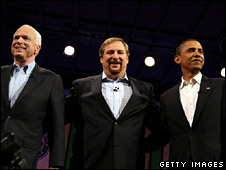 An immediate telephone poll by CNN and Opinion Research Corp found 51% said Mr Obama had won, to 38% for Mr McCain. A poll of uncommitted voters by CBS News found that 39% gave Mr Obama victory, 25% thought John McCain had won, and 36% thought it was a draw. Both campaigns claimed victory, with Mr McCain’s team saying their candidate had shown a “mastery on national security issues” while Mr Obama’s aides said he had passed the commander-in-chief test “with flying colours”. Tens of millions of Americans were expected to watch the debate on TV, with only about five weeks to go before the 4 November elections. Senator McCain said he did not need “any on-the-job training”. “I’m ready to go at it right now,” he added. But Senator Obama said Mr McCain had been “wrong” about invading Iraq and that the war had led the US to take its eye off the ball in Afghanistan, where it should have been pursuing al-Qaeda. 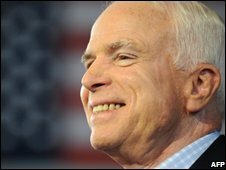 Mr McCain argued that as a result of the “surge” – which involved sending some 30,000 extra US troops to Iraq – US military strategy was succeeding. “We are winning in Iraq and we will come home with victory and with honour,” he said. The televised debate in Oxford, Mississippi, focused largely on foreign policy but began with discussion of the economic crisis gripping the US. Mr McCain said he believed it would be a long time before the situation was resolved. Mr McCain attacked Mr Obama over his record on finance, saying he had asked for millions of dollars in so-called “earmarks” – money for pet projects – as an Illinois senator. The Republican also suggested a spending freeze in many areas apart from defence, but Mr Obama likened the proposal to using a hatchet when a scalpel was needed. Both candidates agreed that the bail-out plan would put massive pressure on the budget of the next president and mean cuts in government spending. Asked about Iran, Mr McCain stressed that Tehran was a threat to the region and, through its interference in Iraq, to US troops deployed there. He outlined a proposal for a “league of democracies” to push through painful sanctions against Tehran that were presently being blocked in bodies like the United Nations because of opposition from Russia. He criticised Mr Obama for his previously stated willingness to hold talks with the leaders of Iran without preconditions. Mr Obama rejected that criticism, saying he would reserve the right as president “to meet with anybody at a time and place of my choosing if I think it’s going to keep America safe”. However, he said he agreed with his Republican rival that “we cannot tolerate a nuclear Iran” and the threat that that would pose to Israel, a staunch US ally. Mr McCain accused Mr Obama of “a little bit of naivete” in his initial response to the conflict between Georgia and Russia. “Russia has now become a nation fuelled by petro-dollars that has basically become a KGB [former secret services name] apparatchik-run government. I looked in [Russian Prime Minister Vladimir] Mr Putin’s eyes and I saw three letters – a K, a G and B,” McCain said. Speaking about the so-called war on terror, Mr McCain said he believed the nation was safer than it had been the day after the 11 September 2001 terror attacks but there was still a long way to go. Mr Obama pointed to the spread of al-Qaeda to some 60 countries and said that the US had to do more to combat that, including improving its own image as a “beacon of light” on rights. “One of the things I intend to do as president is restore America’s standing in the world,” Mr Obama said. Mr McCain sought to distance himself from President George W Bush’s administration, which has very low public approval ratings. “I have opposed the president on spending, on climate change, on torture of prisoners, on Guantanamo Bay, on the way that the Iraq war was conducted,” he said. Mr McCain had earlier vowed not to attend the forum in Mississippi until Congress approved the economic bail-out plan, but he reversed his decision after some progress was made towards a deal. Hillary Clinton has called on Democrats to unite behind Barack Obama as the party’s presidential candidate, saying she was his “proud supporter”. Speaking at the party’s nominating convention, Mrs Clinton said they could not afford to lose to the Republicans. Mr Obama, who beat Mrs Clinton in the primary race, will formally accept the party’s nomination on Thursday night. He will stand against Republican John McCain in the presidential election on 4 November. Mrs Clinton, who was given a standing ovation as she took the stage, thanked those who supported her through her campaign but said Mr Obama was now “my candidate”. The party could not afford “to see another Republican in the White House squander the promise of our country and the hopes of our people”, she said. “We are on the same team and none of us can sit on the sidelines,” she said. She described Mr McCain as “my colleague and my friend” but went on to attack his record and links with President George W Bush. “We don’t need four more years of the last eight years,” she said. Giving the convention’s keynote speech beforehand, ex-Virginia Governor Mark Warner said Mr Obama was the leader the US needed in the “race for the future”. “We need a president who understands the world today, the future we seek, and the change we need,” he said. He also attacked Republican presidential contender John McCain as promising “more of the same” as the Bush administration. Mr Warner is running for a Senate seat in Virginia, targeted as an important swing state by the Democrats in the November elections. He commented on the daunting prospect of speaking after the last convention keynote speaker – Mr Obama in 2004 – and before Mrs Clinton in 2008, but said Americans should let hope replace fear. “Tonight, looking out at all of you, and with a deep faith in the character and resolve of the American people, I am more confident than ever that we will win that race and make the future ours,” he concluded. Democratic Party chairman Howard Dean sought earlier to dampen criticism that the convention so far had been too soft on Mr McCain, saying there was still “plenty of time” for tough-talking. He also played down suggestions of a rift between supporters of Mr Obama and Mrs Clinton, saying there was “not a unity problem”. 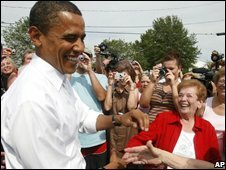 Mrs Clinton had already thrown her political weight behind Mr Obama and dismissed suggestions that the party is divided. But opinion polls had indicated that despite her repeated statements of support for Mr Obama, many of her supporters said they would rather vote for Mr McCain than for her former rival. The BBC’s Jamie Coomarasamy, in Denver, says her many supporters seem divided between those who are, however reluctantly, supporting Mr Obama and those who say they may vote for Senator McCain. Terry McAuliffe, who was the chairman of Mrs Clinton’s campaign, told the BBC: “Every single night we need to be laying out why John McCain’s bad for America. 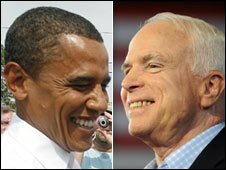 A poll from CNN/Opinion Research Corp suggests that American voters are evenly divided between Mr Obama and Mr McCain, at 47% each. 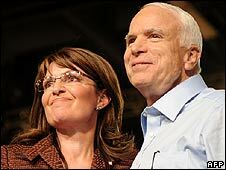 Mr McCain is due to be nominated next week at the Republican Party’s convention in Minneapolis-St Paul, Minnesota. He campaigned in Arizona on Tuesday, telling veterans that Mr Obama’s opposition to the Iraq war and preference for multilateral diplomacy could undermine US leadership in the world. While the first night of the convention was devoted to fleshing out the life story of Barack Obama, Tuesday was billed as “Renewing America’s Promise” and featured political heavyweights, including state governors and prominent House and Senate leaders. Iowa Governor Chet Culver used his time on the convention floor to suggest big oil firms were backing Mr McCain, “bankrolling his campaign and gambling with our future”. Pennsylvania Governor Ed Rendell, a Clinton supporter, also attacked Mr McCain’s energy policy, suggesting he was more interested in giving tax cuts to oil firms than in safeguarding the environment. 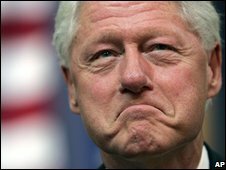 Mrs Clinton’s husband, former President Bill Clinton, takes the stage on Wednesday night, when Mr Obama is to be formally nominated. Democratic officials are said to have brokered a deal between the Obama and Clinton camps for the nomination that is meant to appease die-hard Clinton supporters. 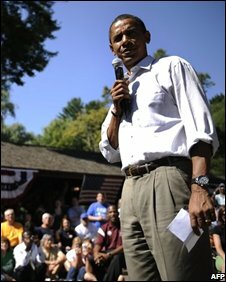 Some states would be allowed to cast votes for both Mr Obama and Mrs Clinton on Wednesday before the roll call is ended with the unanimous nomination of Barack Obama. The first African-American to be nominated as a US presidential candidate, he makes his appearance on the closing night of the conference, when he is to address a crowd of an expected 80,000 people at a sports stadium. After being attacked as a “celebrity” by the McCain campaign, the Democrats used the opening night of the convention to try to show the Illinois senator as a family man with normal concerns.